For the average company responding to our CloudPulse survey, 42% of its applications use some form of cloud-based storage services. To be sure, most companies still take a fairly cautious approach; 60% report that half or fewer of their applications are linked to cloud storage in any way. 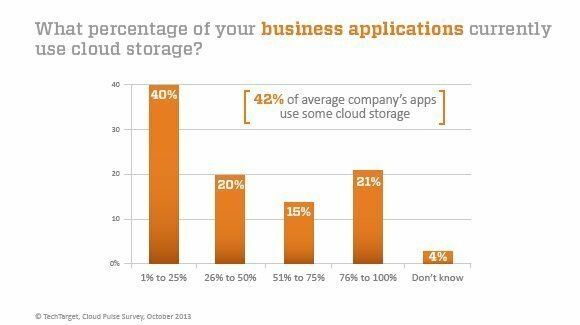 On the flip side of that equation, 36% noted that more than half of their applications tap into cloud storage services. Considering all cloud storage applications -- e.g., primary and near-line storage, backup, disaster recovery and archiving -- 55% of companies look to a cloud storage service to provide software that will move data in the cloud. Twenty-three percent use other software that hooks into cloud-based storage services and 16% have installed on-premises appliances that offer a local cache with a link to the cloud.